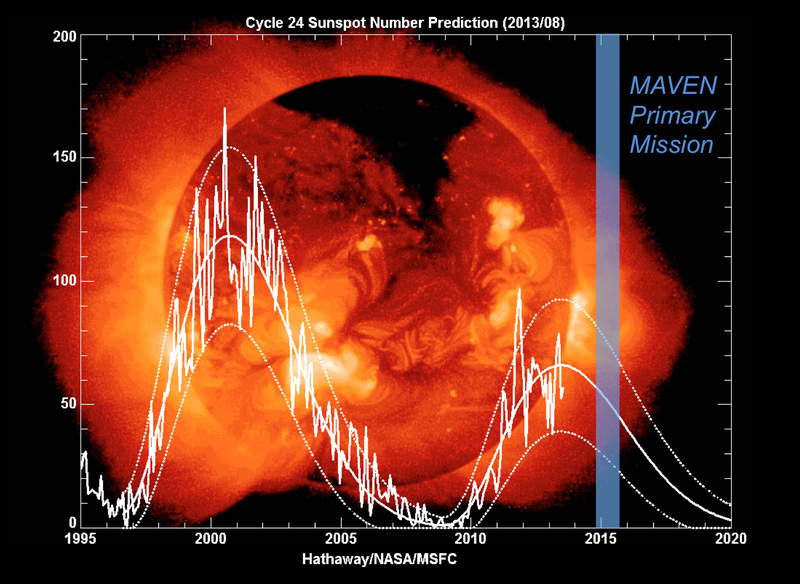 MAVEN has arrived at Mars at a time in the solar cycle that is traditionally rich in major space weather events. The spacecraft is equipped with several instruments devoted to measuring the solar wind and how solar energetic particles and extreme ultraviolet irradiance interact with Mars’ upper atmosphere. These experiments have been specifically designed to determine whether space weather events increase atmospheric escape rates to historically important levels. Taking these approaches allows MAVEN scientists to determine how various space weather events affect the upper atmosphere of Mars today and how they have contributed to its evolution over time. Capturing events of different magnitudes becomes more likely over time and contributes to producing more accurate model extrapolations back in time. The ENLIL model below is produced by the integrated Space Weather Analysis System (iSWA), developed to accurately specify and forecast both the large-scale and local space environments and their probable impacts for NASA missions, including MAVEN. By combining the most advanced space weather models currently available with concurrent space environment information from satellite observations, iSWA provides real-time forecasts and presents actionable space weather information. Models like this allow scientists to predict what impacts certain solar wind and coronal mass ejection (CME) levels can have on satellites and planets throughout the inner Solar System and provide information critical to preparing for space weather events, including velocity, density, and dynamic pressure of solar winds and CMEs.